Vegetation regions. Geographical areas characterized by distinct assemblages of flora communities. Ukraine is divided into four broad vegetation zones: (1) the European broad-leaved forest belt region, (2) the European-Siberian forest-steppe region, (3) the Eurasian steppe region, and (4) the Euxinian province of the European broad-leaved forest region. Within those zones anomalies exist that are governed by other factors, such as soils and elevation. Thus, in northern and northwestern Ukraine (Polisia), where sandy soils prevail, the broad-leaved forest zone contains pine and oak-pine forests. The mountains are characterized by altitudinal zonation of vegetation, in response to increasingly colder and wetter conditions with higher elevations. Thus, the broad-leaved forests of lower elevations merge, at higher elevations, into coniferous forests and then, at the highest elevations of the Carpathian Mountains and the Caucasus Mountains, give way to alpine meadows. Plant communities in Ukraine have evolved and changed over time. In the Eocene period the territory of what is now Ukraine consisted of shallow seas and low islands covered by subtropical vegetation (palms, laurels, myrtles, eucalypti, sequoias, and cypress). Increasing continentality following the rise of the Carpathian Mountains and the disappearance of the Paratethys Sea during the Pliocene brought about a change in vegetation: representatives of the subtropics were gradually displaced by deciduous broad-leaved species (beech, oak, chestnut, walnut, and tulip tree). In the south, drier conditions gave rise to the prevalence of grassland. During the Pleistocene epoch of the Quaternary period a significant cooling (the Dnieper glaciation) caused the impoverishment of forests and a reduction of their area. In northern Ukraine the pine-birch forests prevailed. Broad-leaved species survived in refuge areas (the Carpathian Mountains foothills, the Volhynia-Podilia Upland and the Dnieper Upland, the Donets Ridge, the Crimean Mountains, and the Caucasus Mountains). The forest-steppe (with the presence of pine, larch, and birch) survived near the ice front; to the south of it the steppe vegetation was even less significantly affected by glaciation. In the postglacial (Holocene) period the climatic warming gradually restored most broad-leaved trees and grasses of the steppe from their areas of refuge to areas that almost corresponded to their previous extent. In the mid-Holocene mixed needle-leaved and broad-leaved forests were common, with pine, oak, linden, willow, elm, hazel, and (in swampy areas) alder. In the Carpathian Mountains the pine was replaced by the spruce. By the late Holocene the forest communities were enriched by moisture-loving species such as the beech, fir, and spruce. In Western Ukraine hornbeam gained significant distribution. In Subcarpathia and in the Carpathian Mountains beech and coniferous forests with spruce and fir became established. A more humid climate during the late Holocene was conducive to considerable expansion of peat bogs in the northern and northwestern part of Ukraine. The steppe attained its northern limits during the middle Holocene period. With the agricultural colonization of the steppes from the 10th century, field crops replaced much of the grasslands and non-native plants were introduced into the region. Today most of the land area of Ukraine is covered by vegetation planted or sown by people. In 1981, of the total land area of Ukraine (60.4 million ha), 70.5 percent (42.5 million ha) was agricultural lands, either cropped or used for hay and pasture (see Land use). The nonagricultural lands, some 24.8 percent of the total land area, may be considered as still supporting natural vegetation. Such remnant areas of natural vegetation, although modified by centuries of human activity, provide some clues as to what the plant communities must have been like on most of the remaining land areas. Of particular importance in this respect are the forests, which constitute a significant share of the land area in Polisia (26 percent), the Carpathian Mountains (39 percent), and the Crimean Mountains (36 percent). The first attempts to regionalize the flora of Ukraine were made by Oleksander Fomin (1925) and Yevhen Lavrenko (1927). They were soon followed by schemes for the regionalization of the forests (Petro Pohrebniak, 1928), steppes (Yurii Kleopov and Lavrenko, 1933) and wetlands (V. Matiushenko, 1925; Dmytro Zerov, 1938) of Ukraine. Further work on the regionalization of vegetation was conducted after the Second World War by Lavrenko (1947), Zerov (1949), M. Popov (1949), Vladimir Povarnitsyn (1957), H. Bilyk and Ye. Bradis (1962). 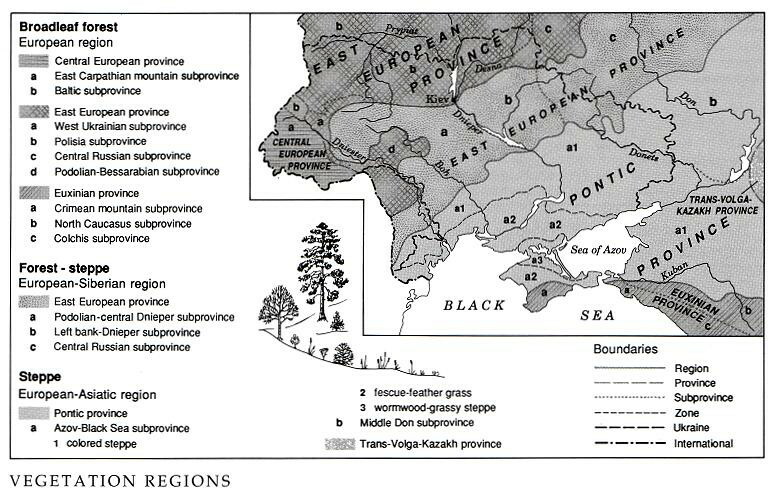 The more recent geobotanical regionalization of Ukraine (accomplished within the broader framework of the European part of the USSR) was worked out by Lavrenko and T. Isachenko (1977) and then modified by Yurii Sheliah-Sosonko and T. Andriienko (1985).